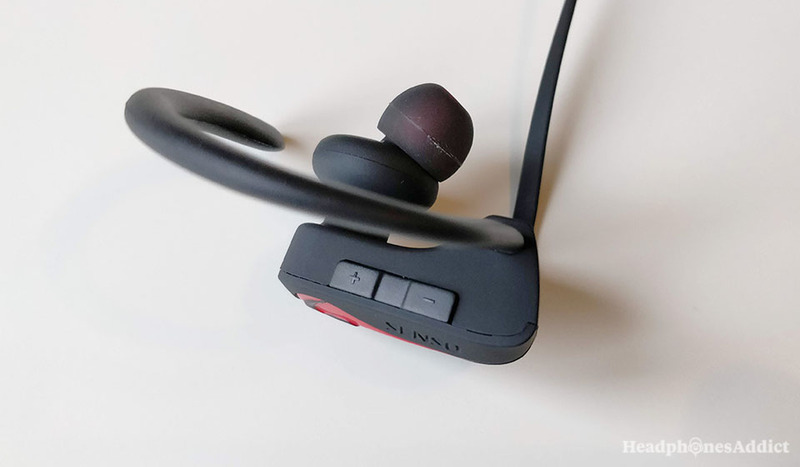 Senso Bluetooth Headphones Review - ActivBuds S-255 Any Good? Super cheap Bluetooth earbuds for basshead sportspeople. 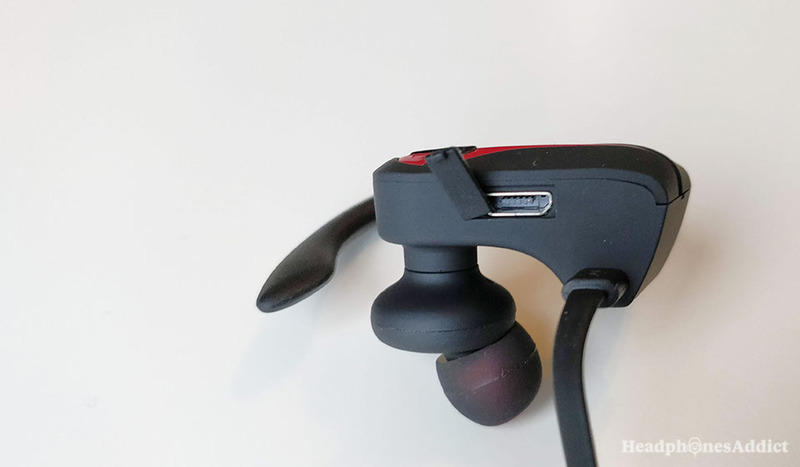 If you’re on the lookout for cheap wireless earbuds (under $30), then Senso ActivBuds S-255 might be the right choice for you. These are massively popular for their low price and rugged design that works. The ear hook design is copied after the famous Beats Powerbeats, so they share the same look. 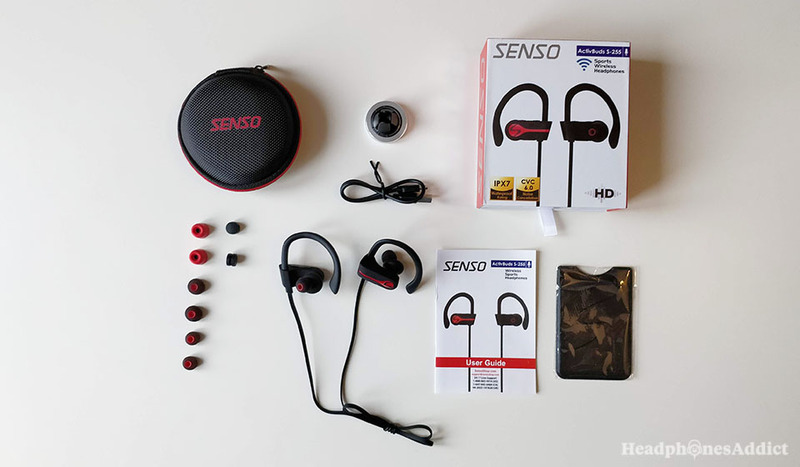 And, if you’re a fan of overpowering bass, Senso Bluetooth headphones are one of the best choices on a budget right now. Learn more below. Since the Senso earbuds are meant for sports, the fit is the main priority. And it’s pretty good. Once you find the right eartips for your ear size and adjust the ear hooks, the buds stay in place even for sprinting. At times, you might need to readjust them, but generally, the fit is stable and secure for working out. Now, when it comes to comfort things aren’t so shiny. Due to the big size of the casing, the wireless earphones tend to brush against the ears often. This creates friction and irritation after a while. Big size also means higher weight. Most often than not you’ll feel their weight, combine it with constant friction, and you’ll want to take them off after about an hour. True, memory foam ear tips (included in the package) help but don’t solve the problem. Generally, comfort isn’t top notch but decent. If you need wireless sports earbuds for an hour or so per session, the Senso ActiveBuds will do the job. If you’re a marathon runner that needs to wear earphones for longer, avoid these. Memory foam eartips come with the package and are the best choice overall. Just like other in-ear headphones, the Senso Bluetooth earbuds sport good passive noise isolation as well. Most of the ambient noise will be blocked out, and you’ll only focus on your music. It’s a good thing if you want to create your own private bubble and avoid others bothering you. Furthermore, there’s basically no cable noise. Since the wireless headphones are worn behind the neck cables aren’t such a big issue. You can always put on a cable clip and control the length, so it fits you perfectly. Senso Bluetooth in-ear headphones feature Bluetooth 4.1 and CVC 6.0 noise cancelling microphone technology. From wireless Bluetooth, you can expect the standard 30ft (10m) of range without obstacles. Generally, the connection is stable and doesn’t break or distort the music. Connecting is as easy as pressing and holding the power button (right red “S” button), on turned off earbuds. Pairing will begin automatically, and all the steps are described in the quick start guide. What Bluetooth codecs Senso earbuds support? But, considering the price, this isn’t such a huge issue, especially since the bass is so strong. A better codec wouldn’t make a difference. Senso Bluetooth headphones are charged via micro-USB port. The improved battery life is one of the new features of this updated model. Now, you’ll get up to 8 hours per full charge. This is plenty of power for many workouts or for a longer trip or hike. You charge them with micro-USB cable, and it won’t take you more than 2 hours to do so. Overall, it’s solid battery performance in this price range. The wireless earbuds are fully plastic with flat rubber cable and memory ear hooks. When you take them in your hands, they feel solid without major weak points. It seems like a well-thought through design with a proven track record. It’s not a surprise they also have an IPX7 rating which makes them waterproof. All in all, they should last you long enough to justify the price. 3 buttons control all the functions. 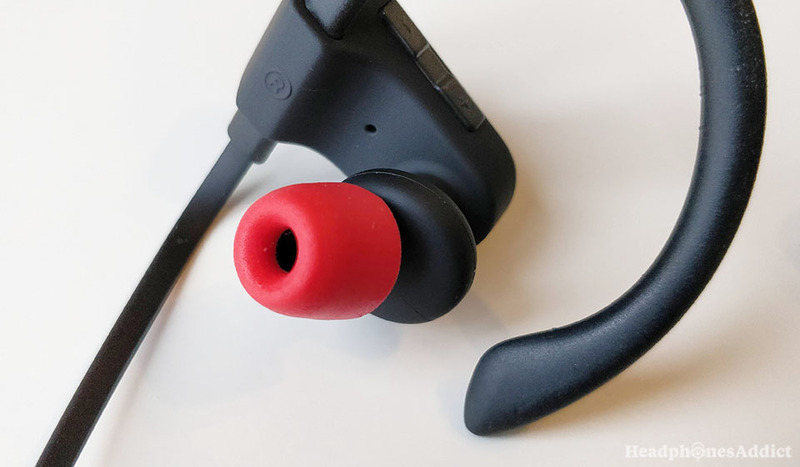 The Senso sports earbuds have a built-in mic which is of okay quality. As is the case with built-in microphones, they send through too much static and background sounds in noisier environments. You can still make a regular call in a peaceful place but don’t expect to hold a serious conversation next to a busy street. Additionally, there are 3 built-in remote buttons. The main one, red S logo on the right bud is the multifunction button. It controls powering on/off, answering/hanging up calls, calling last number and pairing. The other 2 buttons + and – control volume and song selection. The buttons are easy to distinguish and give good feedback, so you always know what you’re pressing. It’s the usual features you get from wireless headphones for working out. You get quite a lot of stuff, though some of it doesn’t make much sense. 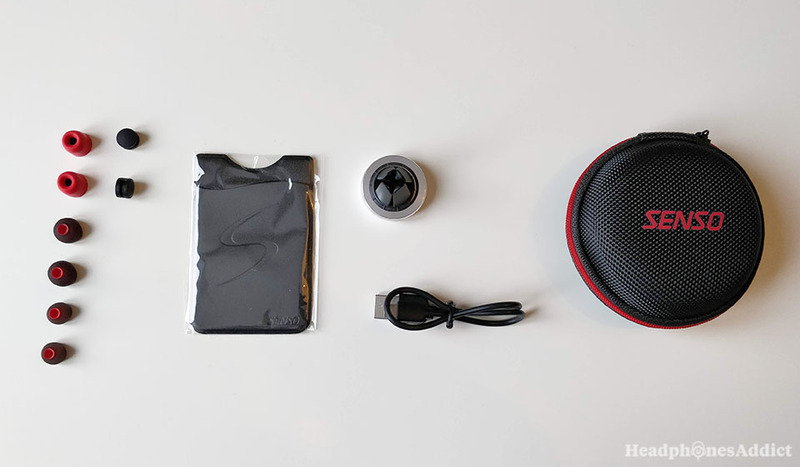 So, apart from Senso wireless buds, you get 4 pairs of ear tips (one pair of memory foam), 2 wire clips for cable management, standard charging cable, a nice hard carrying case with a zipper, and a cellphone card wallet and car mount. Now, I’m not sure why the cellphone card wallet and car mount are in the package, but that’s something you get as an extra. Probably to increase your perception of value. If you need these things great, if not, you can just gift them to somebody who does. For the price, you get more than expected, and that’s a good thing. “Big” earbuds come with deep bass. Now to the most important thing, sound quality. To not waste your time, the Senso wireless earbuds are bass-heavy to the point of distortion. The bass is massively overpowering, so it overshadows the mids and highs. Therefore, if you’re a bass lover, you’ll like the Senso headphones a lot. You’ll get plenty of deep bass from any song you play. But, from an audiophile’s perspective it isn’t detailed but “boomy.” Lots of “oomph” with little else. For non-bassheads, these will probably be fatiguing and non-satisfactory. Nonetheless, if you don’t mind strong lows and aren’t a picky audiophile, you’ll be more than happy. Heavy bass is a legitimate sound taste, and nobody has the right to tell you otherwise. Additionally, sibilance isn’t a problem since highs always hide in the presence of bass. 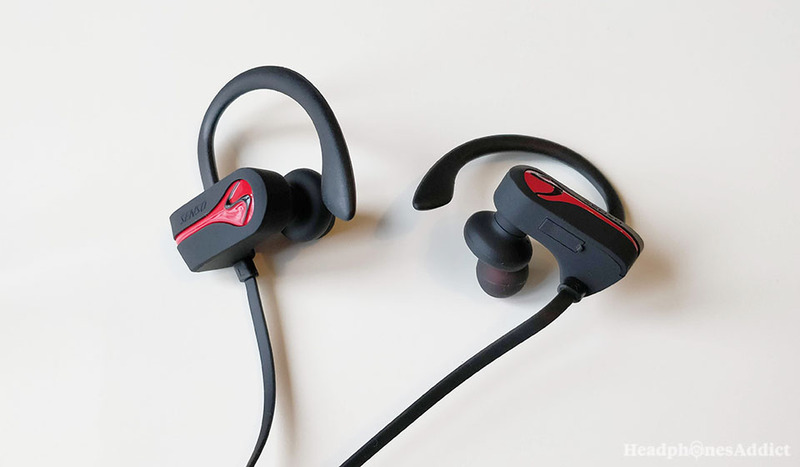 Senso Bluetooth headphones, ActivBuds S-255, are an excellent choice for a basshead on a budget that wants reliable wireless earbuds for working out. If you’re looking for cheap sports earbuds with heavy-bass, then these are worth checking out.